I wasn’t, I simply did. I never wanted to be a tree in the first place. I wanted to be a lumberjack. Yes! A lumberjack! Leaping from tree to tree! The crash of the mighty oak! The elm! The larch! With my best girlie by my side! We’d sing, sing, sing! So far, I’ve enjoyed every one that I’ve touched. That includes: historical(ish) fantasy, mythology, horror, contemporary fantasy, sci-fi. Best: getting thoughts to paper and hearing about someone else enjoying the madness. Worst: editing I suppose. Hardest: advertising. I enjoy sharing what information I have. When I started out, a lot of these websites didn’t exist, or were unknown to me, and I try to remember that any time I meet someone new to writing. If I can share what I know, I will. 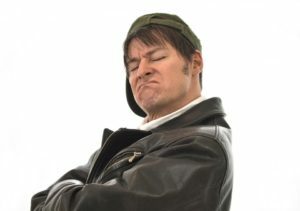 I didn’t choose this thuglife, it chose me. I went indie because the more I look into publishing through others, the less benefit I see in it. Unless I manage to make my way into a publisher, anything else is really me just paying someone way too much money for something I could either do myself (book covers, advertising), or hire someone to do (also book covers, and editing). No contracts, no concern that some small publisher is skimming more off the top than they should be; I can write what I want, when I want, and as much (or little) as I please. A short sci-fi story called The Mudlark, lettering a comic called Char13 (issue 2) that is a really fun sci-fi, apocalyptic western. I’m also writing a 10-12 issue comic tentatively called One Flag that’s set in the near future when a super-person runs the country, and how easy it is to for society slip into madness when all the wrong things are done for the right reasons. Lastly, I’m working on my 10th book, tentatively called Damsels and Dinosaurs. It’s about a super-person named M, and his girlfriend, Iris – who happens to be an android. They go on a vacation to the era of the dinosaurs, only to find out the world is also inhabited by fantasy creatures and such. So, you know, elves, dwarves, magic, raptors: same ol’ same ol’. Changes with the day. Today it’s the misanthropic Domitianus. 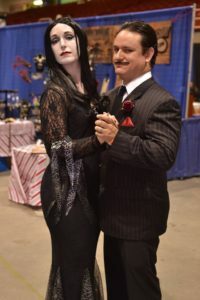 My wife and I are dressed as Gomez and Morticia Addams at Crypticon. It’s a Kansas City area horror convention.